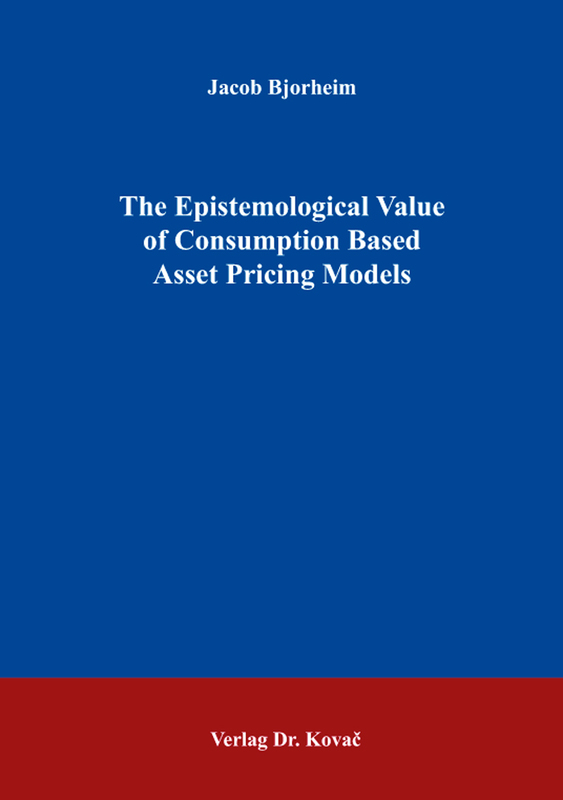 The Epistemological Value of Consumption Based Asset Pricing Models. Dissertation von Jacob Bjorheim, Verlag Dr. Kovač 2015, 326 S.
The book is a philosophical analysis of the consumption based capital asset pricing model (CCAPM), investigating in particular its epistemological and methodological foundations. Financial markets are integral parts of advanced and developing economies. They matter because they channel unspent household income into banks’ savings accounts and assets such as bonds and stocks. Financial economists have traditionally taken interest in the pricing mechanism that underlies this capital allocation. The consumption based capital asset pricing model (CCAPM) is a prominent effort to describe, explain and predict such prices. It tells a story of investors’ trade-off between consumption now and later and which portfolio of assets to hold. The CCAPM based narrative intuitively makes sense, and the chosen methodology involving theoretical assumption, mathematical models and empirical tests follows the professions’ standards of good scientific practise. But does CCAPM’s research programme provide knowledge for use? The book seeks to answer this question in a novel way. Instead of embarking on yet another asset pricing research project, I let Philosophy of Science inform my analysis. Following a “primer? introducing essential CCAPM topics and notations, I discuss, in turn, its theoretical foundation, mathematical model, and empirical test results from a philosophy of science perspective. I find that a few fundamental principles and several auxiliary assumptions combine to develop a simplified, partial and idealized theory of investors, financial markets and assets. The model reflects and represents this theory but also makes narrow claims that are distances away from the real situations they target. Unsurprisingly, ideal model assertions fail standard statistical tests of significance. I conclude that mathematical deductive modelling rooted in orthodox, a priori based fundamental principles create ideal and fictional settings that limit their scope and portability. The development of even more granular models within this orthodox paradigm that searches for “event regularities? will not render the desired knowledge for use. The real situations are possibly too complex to be captured in simplified assumptions, ideal theories and mathematical structures. Novel methodological and ontological approaches to asset pricing are in demand. Hence, claims about tendencies in the real data might replace the current focus on point-forecasts.